Copyright 2000 CSM. Reproduction prohibited without authorization. Paul Berry gave us an excellent monograph, The Christian Inscription at Pompeii, from the same press in 1995. In that previous monograph, he demonstrated, through archaeology at Pompeii, that Latin was already being used in the Christian liturgy at or before the time of the eruption of Mount Vesuvius in A.D. 79. 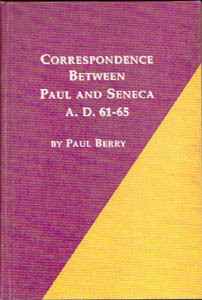 Berry has now followed up that work with one on The Correspondence between Paul and Seneca, A.D. 61-65. Latinists have, of course, known of this correspondence, but the liberal scholars of recent centuries have tended to dismiss it as probably spurious. A new school of modern scholars, like Berry, are once again arguing for its authenticity, which, if granted, provides strong proof that St. Paul was as articulate in the language of the Caesars as he was in that of Pericles. Berry is a strong scholarly advocate of the position that the primary language of Christianity in Italy was not Greek, even from the Apostolic Age, but Latin. In this, he confirms the contentions of one of the Traditional Latin Mass's greatest historians and rubricists, Adrian Fortescue. After a introduction that summarizes forcefully the evidence for the primacy of Latin in the Apostolic Age, Berry presents each of the letters, eight from Seneca to St. Paul and six from St. Paul to Seneca. First he gives an architectural facsimile from the original 9th-century copies in the State Library of Vienna, written in a quite legible Carolingian hand. Then he gives a facing transcription in modern type, together with a suggested translation, followed by copious commentary on the content. When St. Paul was barely known as an itinerant preacher, the Roman philosopher Seneca was the leading figure not only in the world of philosophy and literature, but in government, as he was the principal advisor to the young Nero. Seneca, one of the leading Stoics, was highly regarded by early Christian thinkers -- Tertullian, St. Jerome, and St. Augustine, among others --, and his Roman Stoicism undoubtedly helped to form the intellectual basis of Christian philosophy and theology. That the world's greatest philosopher at the time and the Christian Faith's greatest Apostle should have had an exchange of thought while the Apostle was in Rome, eventually to be martyred there, is truly a watershed event. Those with a basic familiarity of the Latin language should be able to handle the original fairly well (although the commentary is not grammatical in nature). The Latin style is that of the Silver Age, the century or so after the Golden Age authors like Julius Caesar and Cicero, which are those usually studied in the schools. Unfortunately, the brilliance and depth of Seneca is usually held off in colleges and universities until upper division or graduate studies. However, there is no need to do this. Seneca's style, though a bit terser than the earlier classics, is certainly apprcachable, and indeed delightful.